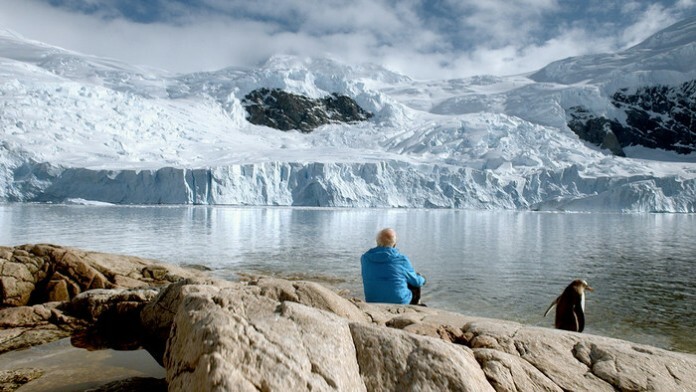 Though French glaciologist Claude Lorius recounts expeditions that have since thrown up feelings of frustration and anguish in regards to global warming – there’s a distinct sense of nostalgia attached, and it’s an emotional experience watching him retrace his steps from when just a young man, in Oscar-winning documentarian Luc Jacquet’s latest endeavour, Ice and the Sky. He recollects what are seemingly minor, insignificant details – but they aren’t to him. In that regard we can see similarities to Salt of the Earth (2014), not just in the tone but in studying man’s relationship with the world he inhabits, through the eyes of somebody who has seen it all. Lorius has taken part in over 20 polar expeditions, developing an affinity to the Antarctica, and was an innovator behind the discoveries found within ice at the Vostok Station, as they analysed ice that was from 420 thousand years ago. It was during his findings, however, that he became aware of the startling rise of global warming, and how we’re dramatically destroying the planet from within. His words narrate this tale (though spoken by actor Michel Papineschi) and thankfully he has such a poetic, eloquent means of describing his experiences. It certainly wouldn’t have been helpful to proceedings had he not been so beautifully expressive and articulate in his speech. He takes you there with him, making for an immersive experience, as he describes the sounds and the smells of his time spent on the expeditions. Lorius has a knack for making his words so accessible too, deviating away from the tedious, scientific aspects of it all, which, while certainly fascinating to many, are likely to bore everybody else. Instead Ice and the Sky depicts a very personal journey, and an intimate entry point into this world, that makes it easy to invest in and comprehend. It also helps that we’re provided with a wealth of footage from the era depicted, implemented expertly by Jacquet. We see Lorius talking to camera when a younger man, and various other images that help to illustrate this narrative, and bring these anecdotes to life. Almost everything Lorius speaks of, from the spontaneous football game they played, to examining composition of the bubbles of air trapped in the ice – it’s all been captured on camera. Ice and the Sky is all about global warming without barely mentioning global warming. This is about our subject’s research, his experiences, the joys in his discoveries, the trepidation and fear in being away from home for such lengthy periods and the laborious nature of his work. But then when that’s all been established, and he is able to conduct his examinations, that’s when it becomes clear what humanity is doing to the planet. This is by no means a preachy documentary, it’s a fascinating, intimate human tale with a deep, ingrained and profound message to it – and one we really should be paying close attention to. A fascinating, intimate human tale with a deep, ingrained and profound message to it.